Jess is a researcher on a quest to give the one-hundred-year-old skeleton, discovered in the exhumed grave of a prominent bishop, an identity. But she's not sure of her own - her career is stalling, her marriage is failing. She doesn't want to spend hours in the archives, rifling through dusty papers in an endless search for a name. And when a young man named Hayden makes clear his interest in her, Jess has to decide what is most important to her. The Bishop's Girl by Rebecca Burns was a fascinating and intriguing read. Weaving its way through various time periods in a way that wove together a complex story, which linked together extremely well. 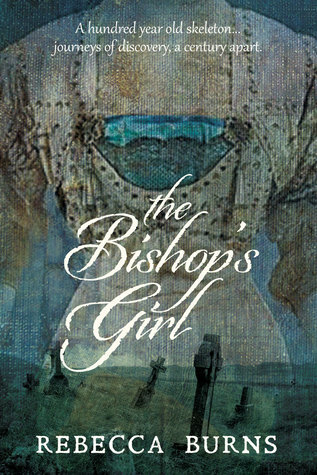 Jess is an archivist working for a demanding researcher - Waller, he has spent many years trying to find out the name of the mystery woman buried with a bishop in France during the First World War. How did that happen? DNA says they are related, but how? Eventually Jess after much painstaking work links up with another researcher at her work place and together they begin to untangle the mystery. At home Jess' marriage is going through a time of crisis, her husband is remote, her older son a typical teen and her daughter a little bewildered from what is happening around her. I felt sorry for Jess, as the intimacy from her marriage seems to have disappeared, but will she find it elsewhere? We are also taken back to Greece, to England and to France in the late nineteenth and early twentieth century learning about the people who populated the letters that Jess was reading and researching. I don't want to talk too much about the plot because much of the satisfaction of this book is seeing it all revealed. The characters are very real and ordinary. Yet complex. What stands out is the question about how well do we know others? What secrets do they carry? What hurts? What are the motives for certain actions? People are multi layered. I appreciated Jess' efforts to find and name the unknown girl, to give her a place and have her remembered. To ultimately care and respect this young woman. It was good and clever as well. Very readable. The cover is very unusual, yet relevant to the story. Excellent review, Kathryn! Well-written and lets us make an informed decision. (I would pick it up). Haha, yes informed decisions are important, and thank you for the kind words. This multi-layered story sound very intriguing. I'm glad you enjoyed it. I did enjoy it Pat, a little out of my usual reads, but not too far away from them. It was intriguing. This sounds wonderful! I love the idea of the complex characters and that the main character is focused on giving a name to the skeleton. Yes it was the compassion of that I think that was the best. Sounds really interesting. By the way- I love that you have an "Add to Goodreads" widget!